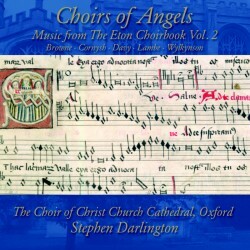 Following a critically acclaimed recording of music from the Eton Choirbook, More Divine Than Human (AV 2167), The Choir of Christ Church Cathedral, Oxford returns with a second volume from the vast collection of 15th-century English sacred music, Choirs of Angels. The works range from John Browne’s richly scored eight-part O Maria salvatoris mater, the first piece in the Eton Choirbook, to William Cornysh’s exquisite miniature Ave Maria mater Dei, the choirbook’s shortest work. The compositional range in the Eton Choirbook demands extraordinary virtuosity from its performers, and Stephen Darlington and his choir of men and boys do this glorious music tremendous justice.